This is an American made dog harness. 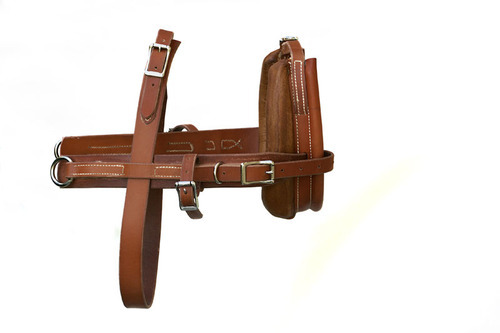 Made with the finest American Tanned English bridle leather, quality roller buckle hardware of which some are of stainless steel and the balance is nickle plated brass. Sewn with waxed linen thread, which is not effected by ultra-voilet rays. The collar pads are made of a firm but flexible Polyester felt covered with a 4-5 oz. Chap leather, encased in bridle leather and sewn with linen thread. The bow of the collar is made of 3/8" alumium rod which will not rust inside of the bridle leather, causing the bridle leather to rot. This harness will wear for years, without suffering the effect of damp and cold weather. 1. Start off by measuring around the dog's back, or his girth. To do this you will start behind his front legs, then up and over his back, and back down under his belly until you are back where you started. You now have his girth measurement. This is the most important measurement in sizing for a harness. 2. Next, you will around the dog's neck. This particular measurement may not matter with certain kinds of harnesses, but it is good to have it on hand just in case. 3. If your dog is a little more broadly built, like a Bulldog, go ahead and get a chest measurement too. To do this you will start from behind the dog's front leg. Bring the tape around the front of the dog and around until you reach the same point behind the opposite front leg. Hope this helps. If you need more information please email or call us.